Steven Estes is currently a percussion performance major at the University of Central Florida. He is in his third year of the performance degree, and is also pursuing a business minor. He has studied under Dr. Thad Anderson, Dean Jeff Moore, and Kirk Gay. He has been awarded numerous Scholarships including the Ruth Eckerd Hall "Dare to dream" scholarship, as well as numerous UCF music Scholarships based on audition and merit in the program. 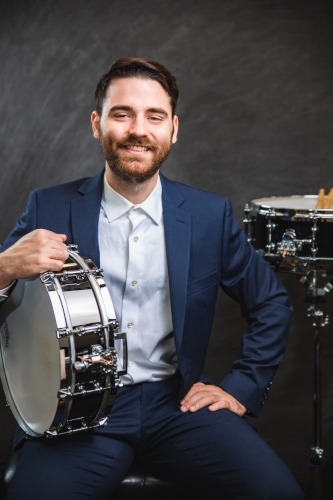 Steven is currently the Principal Percussionist of the UCF Symphony Orchestra, and has been Principle Percussionist of the Wind Ensemble in the past, as well as the drummer for the UCF Flying Horse Big Band, playing on the CD Release, "B.M.O.C." Steven has marched the Boston Crusaders drum and Bugle Corps in the Snare line in 2014, 2015, 2017 and 2018, being a battery section leader in 2018. The 2018 Boston Crusaders Percussion section performed at the 2018 Percussive Arts Society International Convention.